How Far is Altis Oceanique? Want to stay in the lap of luxury side by ocean and experience the finniest facilities and amenities, come and explore this amazing place called Altis Oceanique where search for your dream home will end and you can start enjoying your life, with picture perfect view located near to the beach, this place offers luxury living staying connected to nature and connected to urban life network, Oceanique is a sublime fusion of luxury and nature, of form and function, of thoughtful little details and unwavering focus on quality, which ultimately makes your home a delight to live in not just today, but for several decades to come. Altis Oceanique offers Charming sea view apartment on ECR where you can enjoy Convenience and Immeasurable comfort where you can get fresh air surrounded by beautiful green cover with Indoor and outdoor facilities to live life king-size, where lavish 2BHK flats super built-up area is 1255 Sq ft and with more space 3BHK flats super built-up area varies from 1633 Sq ft to 1793 Sq ft.
As this project is located at one of the best locations in Chennai where you can get amazing location advantages, the places located on ECR are Thiruvanmiyur, Kottivakkam, Palavakkam, Neelankarai, Injambakkam, Panaiyur, Uthandi, Muttukadu, Kovalam and Vilambur. 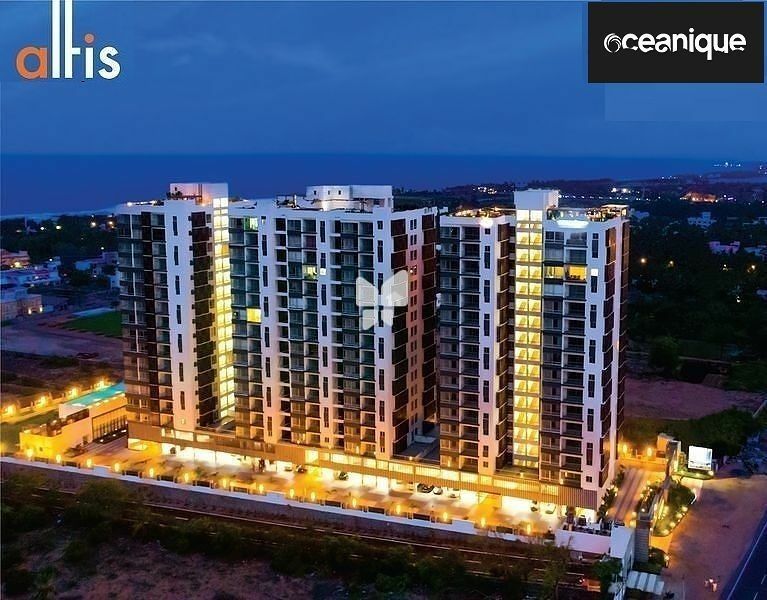 Altis Oceanique has proximity with IT companies, Schools, Hospitals, Colleges, Hotels, Restaurants and well connected by different modes of transportations. Altis Oceanique offers array of amazing amenities some of them are Wi-Fi, Swimming Pool, Visitor's Parking, Clubhouse, Parking. False ceiling will be provided in the living/dining room to architect’s design. Ceiling areas of living, dining, bedrooms & kitchen will be finished with cement plaster and wall putty (JK or equivalent) and painted with tractor emulsion. False ceiling (calcium silicate) will be provided in the toilet areas. Counter top platform (dry fixing) will be finished with 0.7" thick granite slabs 2’ wide at height of 2’ 9” from the floor level and provided with Carysil/Stainless steel sink and provision for fixing washing machine. 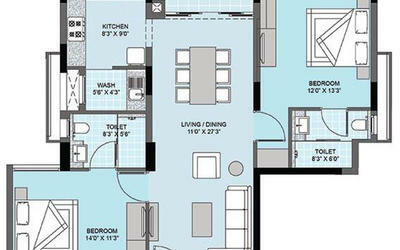 Provision for fixing an exhaust fan, ceiling fan, microwave, fridge, mixer, grinder and aquaguard will be made. All CP fittings will be of GROHE or equivalent make. 1 EWC will be provided in servant rooms. Concealed insulated copper multi-strand wires in all apartments. Each apartment will have to be provided with distribution board having MCBs. All switches and sockets are of MK (Ivory) or equivalent make. Atul Gupta have an experience of 30 years in real estate field and Atul Gupta is a natural leader who is responsible for the tremendous growth of the company, who always focused on providing quality work to their customers without compromising on anything, Altis property wants to have a unique position in the real estate world by proving great customer experience, Atul Gupta is renowned for his financial acumen, particularly in the real estate vertical. He is an expert in financial acumen specifically in real estate, his expertise helps Altis to all ways provide best to their clients. An example to their excellent work is Altis Oceanique in Chennai at ECR which offers luxurious flats. At Altis, they are abide by the four cornerstones of trust, quality, timely delivery and main is customer focus with the rich heritage of experience in real estate and have constructed more than 1.25 million sq. ft of residential spaces with the four cornerstones they are successful in giving quality work to their customer, one more example to their outs standing work is Altis Sri Gayathri Doctors Nest Phase III in Tambaram located in Chennai. · Altis deal with human relationships, not transactions. You matter to Altis, as do your dreams and aspirations. · Altis recognize that integrity is not an optional value-add. Altis are careful to promise only what they can deliver, in terms of quality, timelines and service levels. · Altis believe that Customer is the King. focus on a client-centric approach with the key pillars of support being trust, quality and timely delivery.